AWC is proud to announce a new Alabama Poet Laureate. Jennifer Horne was unanimously selected by the AWC membership after a committee carefully reviewed applications and made their recommendation. 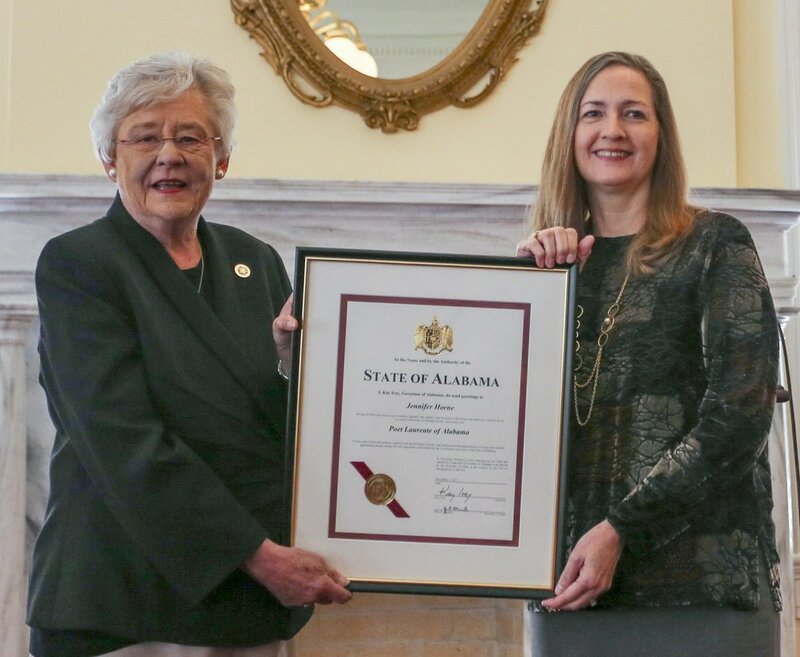 Governor Ivey certified Jennifer Horne as Alabama’s Poet Laureate on November 1, 2017, which began her four-year term. "Alabama Writer's Conclave introduces new Alabama State Poet Laureate"
"Jennifer Horne on Becoming Alabama Poet Laureate"
"New Alabama Poet Laureate Jennifer Horne Takes Center Stage on Alabama Public Radio"
"State poet laureate commissioned by Gov. Ivey"
Governor Kay Ivey and Alabama State Poet Laureate Jennifer Horne at her commissioning in Montgomery, Alabama, November 2017.